For a while I’ve lusted after a GoPro – tiny little self-contained wide-angle HD video cameras which can be strapped to cars, bikes, helmets, all sorts of things. They’re the cameras used for programmes like Top Gear, or where they’re strapped to some bloke skydiving out of a plane to get a point-of-view film; fun stuff and with my impending projects involving music videos I could sort-of justify it. The GoPro Hero 3HD though has got horrendous reviews: from heat issues to random reboots or even just resembling a very expensive brick (you just need to look at Amazon for a litany of woe), so I wasn’t going to fork out the thick end of £400 for the setup I’d like (including the waterproof case et al). Anyway, a week ago I went to Focus On Imaging, the big pro-sumer photography show at Birmingham NEC. Among the stands exhibiting was a dealer who were selling the Jobo JIB4 action camera – essentially a GoPro clone – which piqued my curiosity. I spent a while discussing with the dealer and came away with one including waterproof case, a pile of mounts, extra battery booster, a remote control and a lens cloth for a penny shy of £200. Winner. So what’s it like? Tiny and fun! It’ll do 50fps at 1080p PAL (and a higher framerate of 120fps at WXGA), 170-degree wide-angle, and on exploring the menu system I discovered it had a time-lapse feature which automatically welds sequential JPEGs together to output an MP4 movie: I can squish about an hour’s capture into just under two and a half minutes. It’s been almost a month since I wrote about my adventures in B&W photography and there have been some developments (pun intended) since then. As it seemed to be a hobby which was sticking around, I invested in an Epson V700 scanner – various places including DPReview and Amateur Photographer stated that this was pretty much the best flatbed I could get. Why was I after a flatbed? Well I’d already anticipated I wanted to do some medium-format (MF) photography and most affordable slide scanners are limited to 35mm film and slides so would be useless after a while. The Epson was an investment, and proved to be an exceptional one. So back to the photography: I did a photoshoot on Ilford Delta 3200, the subject being a punk-electro band called Minny Pops. Back in the early 80s they were on the same billing as Joy Division, they were a Martin Hannett-produced band and they were signed to Factory – hell, even Rob Gretton was involved with them; this made the act a perfect band when they played at The Brudenell Social Club in Leeds, perhaps in the style of one of my favourite photographers Kev Cummins. Here’s an example shot (dig around my Flickr stream for more), processed using Ilford Microphen high-grade developer (that particular image was picked up for publication by a UK music national which I’m quite chuffed about – still to see it ‘in the wild’ though). Not bad, and I resolved at that point to start using film a little more on gig shoots where the act would warrant it. I spent most of January experimenting, and mentioned to my Grandmother what I was up to. She told me that she had a big box of photographic kit once belonging to my Grandfather and I was welcome to have a dig round and see what might be useful. It was quite a fun box-ful: the cache consisted of lots of lenses, a few USSR and GDR-manufactured 35mm bodies in varying condition, some filters and a few unexposed spools of film – but the unexpected bonus was finding a Halina A1 twin-lens reflex medium-format camera from the late 50s/early 60s… it had a spool of film inside which I wound on. Now I’d thought about doing MF back in December, even going so far as to working out if I could afford a second-hand Bronica ETRS camera outfit, and I’d decided I would eschew the 645 format in favour of jumping straight to square 6×6 (being a substantial move from plain 35mm so I figured I’d appreciate it more). Dale Photographic in Leeds had a Hasselblad I coveted, but spending £1500 on a MF film setup rather than getting a family holiday wasn’t going to endear me to Nicky so I left it for a while. However, the whole MF thing was still bimbling in the back of my mind, and finding the Halina was timely. I worked out a short workflow to see how it would fare – heck, I didn’t even know if it was light-tight. Thoughts of light-meters led to the brainwave of downloading one from the App Store for my iPhone (perhaps a bit of cheating, others may say ingenuity!). It hardly made a noise when the shutter activated I wasn’t even sure it was working and spent ten minutes exploring to make sure! So far so good. The next day I wandered round the streets of Headingley with the Halina and a fresh roll of Ilford FP4+ 120-roll film. Colleagues at work were curious. I scared the living daylights out of some poor lady in St Michaels Cemetery in Headingley taking photos of gravestones (sorry missus!). Once back at home out came the dev tanks and (after following this tutorial on YouTube on loading 120 film into the Paterson tank) I ended up with some perfectly passable 6×6 medium-format negatives. 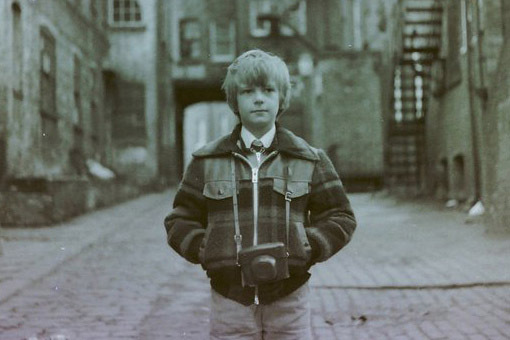 The images were a lot sharper than I’d anticipated, having seen reports that this particular camera was favoured by the lomography crowd because of its soft focus – hooray! Into the scanner. Set the controls. Forgot I set them for 35mm and of course MF has larger negs so I ended up with a gigapixel image – Lightroom struggled over it and Flickr hated it, so eventually settled on 4800dpi, 95% JPEG, 4-pass-plus-IR out of Vuescan. Here are the results (click backwards to see more I took that day) – banal subject matter but I’m very very pleased how they’ve turned out! 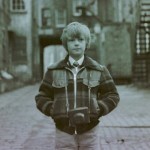 Wonderful square high-contrast images which would make perfect album covers! 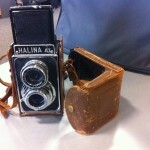 As a sidenote, you remember I mentioned that exposed film in the Halina? Purely on a whim I developed it. It was a Kodak X-Pro film (I think) and thought there wouldn’t be any harm in giving it a shot – but the bloomin’ thing dev’d fine and after scanning I saw the face of my Great-Grandfather staring at me. Blimey – I didn’t actually think almost 40 year-old film would process properly (nor had I really worked out timing for the dev tank, I just left it for 7ish minutes in Microphen). Ellie was fascinated, and we’re soliciting family members to try and date it as it’ll give us an idea when the camera was last used! Anyway, as I left you in my last blog entry tonight I’m heading to another gig, this time to try and shoot a friend’s acoustic act in MF using Ilford HP5 which I intend to push to 1600. How I’ll get on I don’t know – this is a completely manual attempt! Even the practicalities of winding film with only the red-coloured rear window of the camera body may defeat me (given stage lighting) – maybe I should take a torch! I’ll be sure to post the results on my Flickr stream if there are some presentable images, of course. 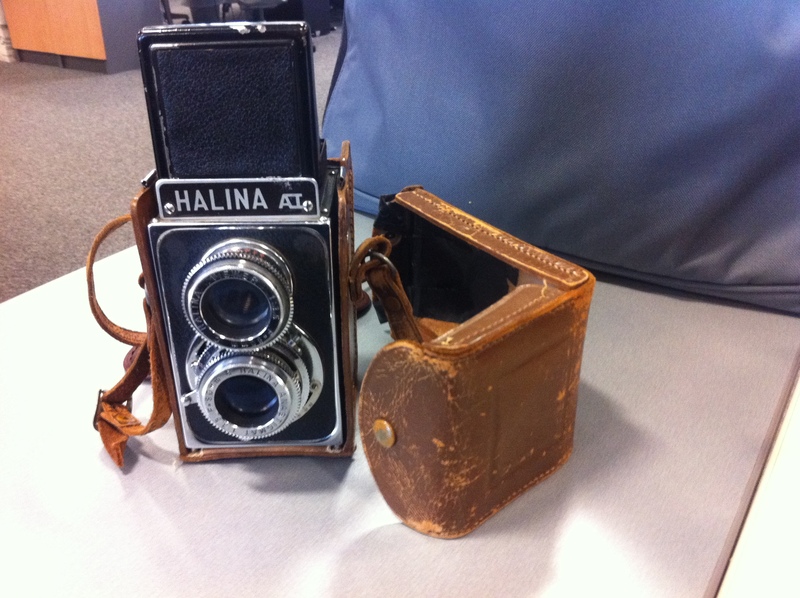 When I was 7 I bought myself a film camera from Wakefield fleamarket – a Halina 35mm camera purchased for £1. I took it all over the place and went through the first couple of films like mad (mostly taking photographs of the sky or the floor because I couldn’t get the hang of the viewfinder). My father was processing film at the time and started loading the occasional spool of B&W in and that’s how I started out in photography… once we’d moved to a larger house he took over the cellar and we did prints too. Almost 30 years later I’m using digital for my semi-professional work: I carry various Canon pro digital bodies around and a complement of lenses (a partial kit-list is on my Flickr profile), and I post-process using Lightroom on the Mac. An average gig shoot for me results in about 200 photos per act and I pare those down into about 40 or 50 shots for a client, all of which is a far cry from 24 frames on film. I recently did a contract in Halifax (good lord deliver me) as part of my dayjob. Lunchtime wanderings uncovered a camera shop near the market (Janet Green Photographic, I’d link to a website but they don’t have one) where there was a window full of second-hand photographic kit – everything from mid-1950s medium-format bodies up to low-end digital, and so a germ of an idea formed – get an old film camera and learn to develop my own photos again. I pressed my nose to the glass almost daily in the hope that a suitable camera would be on display. Christmas drew closer, the end of the contract loomed, but less than 2 weeks before I’d be out of the area one appeared in the window for just £29: a Canon EOS 500N, one of the more recent 135 Canon range. I bimbled in and after verifying it would accept my Canon EF lenses I walked out as the proud owner of a film camera body, some chemicals and a few spools of Ilford FP4+ film. The first thing I noticed was that I was conscious how many photos I wasn’t taking using film. I assumed I’d go through film like wildfire but it took me the best part of 3 days to blow my first 24-exposure film (the second film took a little less time principally because I was out in sunny Halifax getting some gritty industrial images :)). This did make me realise that although I scattergun at gigs I am more inclined to take time to set up a shot elsewhere. Once home and in the kitchen I mixed up some developer and spent 20 minutes lightproofing the understair cupboard. Every last LED from the wireless base-station, burglar alarm, central heating system got double helpings of gaffer-tape. Hallway lights went off, the cracks around the door stuffed with scarves. Total darkness, hooray. I turned the safelight on, loaded the film into the canister and went off to develop it. Right. Safelight. 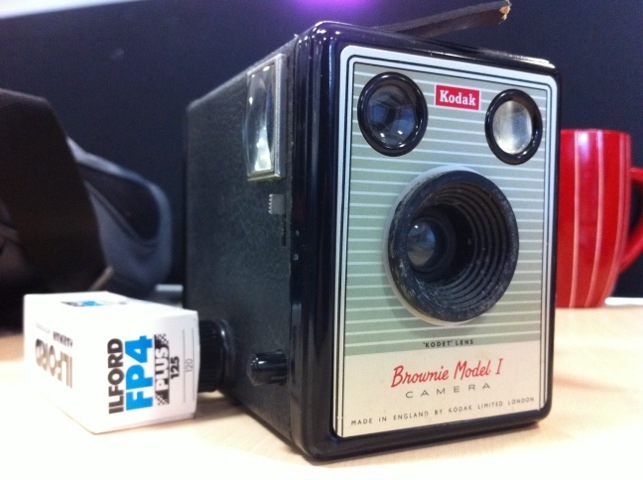 Yeah – about that: there’s no safelight for film… I’d forgotten that bit and overexposed it. I had also been using a dodgy thermometer, not that it would have made much difference. The second time I was a lot more careful and some success ensued, having processed a spool of Ilford HP4+ (ISO400) in Ilfosol-3 developer: this resulted in quite a chunky grain. Still, not bad considering I’ve been trying to remember how to do it all based upon vague memories of watching Dad. As a sidenote: I haven’t been doing any printing, instead using a slide scanner from Maplin to throw the negatives into JPEG files; it’s only a cheap thing with a lamp which shines the slide onto a small CCD and auto-compensates for exposure etc. – the results aren’t very good. This one will do for the moment as long as I put the images through Lightroom, at least until I find a USB slide scanner I’m happy with. Subsequently I walked into Halifax and blew off a spool of Ilford FP4+ (ISO100). I haven’t tried pushing the film yet, I’m taking baby-steps and since Christmas I’ve been using it as an occasional ‘grab camera’ to play with rather than anything serious. Most of my supplies are coming from Amazon marketplace sellers (RK Photographic are sending me most of it including a black bag, a load of FP4+ and a film spool opener). Locally Dale Photographic in Leeds sells chemicals and film which is useful in an emergency and if anyone wants to buy me a present they have a secondhand Hasselblad MF 6×6 120-roll camera with a couple of lenses for £1500… thought not! Update: Julian (aka @liquidsquid on Twitter) said that this was his idea. If I’m going to be perfectly honest it was discussions with quite a few folks which led to this, not least @leica0000, @john2755 and my landlady in Milton Keynes towards the end of last year who gave me a box full of old Patterson developing kit. That said, the Delta3200 was definitely Julian’s idea. For a while, Nicky and I were scanning in old pics from as far back as 1979 when I got my first little 120 roll camera (secondhand off Wakefield market, I think I paid 50p for it!). That stopped when we got a bit too busy since it’s quite time consuming and they had to be done on a flatbed scanner. Fast-forward to yesterday when, in a moment of getting away from a particularly evil programming problem I decided to have a play with the minilab’s scanner unit, finding that a strip of four negs takes about 10 seconds to scan and lab dumps the JPEGs in a directory on the fileserver. Hoorah! I can scan the rest of the stuff in! There’s not as much image degradation as when I was flatbed-scanning the prints themselves. I’ve filled in some gaps from around 1990-1994, where an ex-girlfriend had been through my prints and cut out the photos of any other ex-girlfriend (this is bizarre, it’s like getting a chunk of your life back, like discovering old photos left over from communist-era Russia). It’s fast, there’s no messing around cropping stuff, and the frame numbers are preserved within the filename. I did about 600MB of pics in 45 minutes yesterday. The disadvantage is in trying to remember or work out dates that things happened – I’d quite like the pics to be in chronological order but sometimes that’s almost impossible. I’ll have to dig out my old filofax from home, or see if my Palm has any other data imported from earlier (I kept an electronic diary, and wrote a journal from around 1990 onwards). The only odd thing I’ve found is in scanning any Ilford FP4 film – for some weird reason it crashes the lab with an error. I have absolutely no idea why it does this, but I’ll bring it up with the lab engineer when he next pops round for a cuppa. Consequently spools such as the BBC Acorn User Show 1991 will have to wait. I’ll add the pics as and when I have named and dated them.